Research consistently shows that teacher effectiveness is about engagement, interaction, questioning, positive atmosphere, high expectations and suitable challenge. At the heart of all these areas is the ability to communicate effectively. How you do that minute by minute and second by second is fundamental to what children learn and remember and to how they behave. Richard Churches draws from a range of disciplines, such as psychology, NLP and neuroscience, to provide a practical compendium of communication expertise based on what highly effective teachers do. 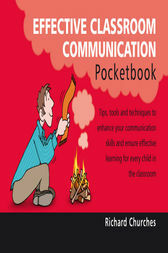 You'll find out how to use influential language patterns to support learning and positive behaviour; the secrets of body language and non-verbal communication; how to communicate to create the right emotional climate; effective questioning techniques; etc. Small changes to your current practice could lead to huge benefits in the classroom.